Fables 10: The Good Prince | Blah! Anymore, I only read a few comics series religiously. I was reading Whedon’s Astonishing X-Men series, but he has moved on and I’m not sure I’ll continue (though Ellis is a tremendous writer). I’ve followed the Ultimates series, which is pretty darn good. But the two series I keep closest tabs on is Powers by Bendis and Fables by Willingham. Fables is by far my favorite series right now. The premise is pretty simple: what if all of the characters from all of our fables existed in the real world? And what if they were real people, in the sense that they have to live like we do in the real world? And what if they were in the middle of a big war for control of the various worlds in which they live? (In the Fables universe, each group of fables — the European fables, the Arabian fables, etc — inhabit distinct worlds that are, nevertheless, connected.) Characters such as Snow White, the Big Bad Wolf, Little Boy Blue, Red Riding Hood, Hansel and Grettle, Gepetto and Pinochio, inhabit this fictional universe, interacting with one another and fighting for their survival. 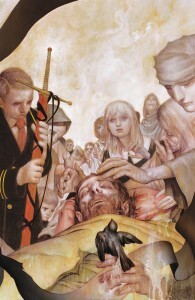 I just picked up Fables #10, The Good Prince, which is the most recent collection of the Fables comic book. This collection focuses on Flycatcher, otherwise known as Prince Ambrose. He is one of the harder characters to identify, but I believe he is the frog that was turned into a prince upon being kissed by a princess. His life is a tragic one, and for most of the series up to now, he has been a janitor working in the Fables’ government office in the United States. However, he comes to the forefront in this tale and does his part in the war against the Adversary, that mysterious entity that has waged war on all Fables (we now know who the Adversary is, but for those of you who haven’t read this series but may, I refrain from spoiling it for you). The art in this collection is a little hit-and-miss for me, but it does an adequate job of conveying the story. But, really, the story is why I am here. The story, as with most of the Fables collections, is outstanding. An epic tale of redemption and perseverence, Flycatcher makes amends for his past failings. I won’t say any more, but I would highly recommend this series to anyone who has an interest in fairy tales and just damn good story telling. For more on Fables, including spoilers, check out this Wikipedia article.